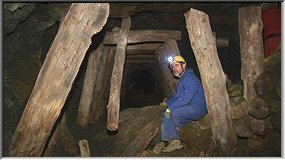 In April 2008, the Shropshire Caving and Mining Club visited the Sierra Minera region of Murcia in Spain to see some of the vast range of ancient and modern mines which survive so well in the area. 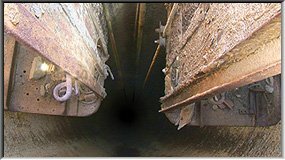 At scores of sites, flat-rope winders stand beside intact steel or wooden headframes over extremely deep open shafts. 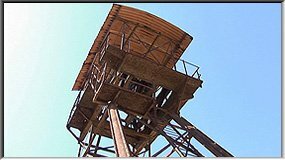 First we visit Las Matildes mining museum near La Unión, where the Fundación Sierra Minera preserves and exhibits a wide variety of mines, buildings and equipment. 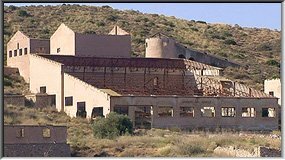 Later we see the huge Corta Brunita opencast zinc mine followed by the picturesque ruins in the Rambla del Avenque. At El Laberinto a tunnel takes us to Mina Obdulia and we then travel to Portman to see a jetty completely cut off from the sea by mining waste filling the bay, and we explore part of the large elaborate processing mill Lavadero Roberto. 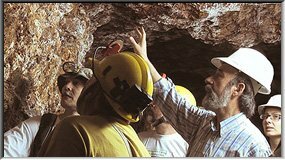 We go underground to see the work being done to make Agrupa Vicenta into the show mine of the Parque Minero de la Unión. Following the "33 Road" mine track over the mountain takes us through Roman and later mining remains including manganese kilns overlooking Portman Bay. At Corta Emilia we were given permission to examine a unique donkey gin. 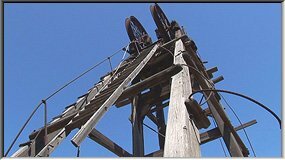 Cabezo Rajado - the "Riven Hill" has been mined for hundreds of years still has plenty to show: 450m deep shafts, ornate steel headframes, a flat rope winder and a large mill containing 40 wooden flotation cells and a ball mill. Back at ground level, The winder at Mina Ocasión has both its flat ropes still in good condition. At El Lirio, levels with wooden pit props lead to fascinating underground stables. In the sidings leading to the railway tunnel Jose Maestre are many rail tipping cars and two locomotives. 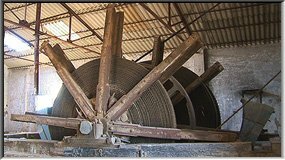 La Parreta is an impressive collection of mill buildings including Lavadero San Ignacio. Mazarrón west of Cartagena is an ochre-red zone of rich lead and silver, mined before the Romans. The hill is cut by open stopes and dotted with open shafts; many with headframes of stone, wood or steel. Under a wooden building, a steam winder still has its flat ropes connected to a wooden headframe. Thanks to Andy Wood for organising the visit and to our Spanish friends Ana Christina Contreras and Paco Fernández Antolinos of the Fundación Sierra Minera; Reme Pagán Martí, Profesor Jose Ignacio Manteca and the Parque Minero de la Unión; and Portman Golf SA for site access. Thanks also to participants including the Friends of La Union Mines; and to Rob Vernon for his excellent research and guidance at and around Mazarrón. This compilation has no commentary. Incidental dialogue in Spanish & English. Over 250 captions are used to identify sites and scenes throughout the DVD. Standard definition DVD copies clearly benefit from the High Definition master quality, this Compilation is also available in 1080i HD on Blu-ray™ disc !